Lately, we have heard a lot about Chrome OS. Every Windows PC manufacturer has expanded their offerings to include a Chromebook, and in some cases, a Chromebox. Chrome PCs are as cheap as dirt, and offer bigger screens than netbooks of the past. Microsoft enlisted popular TV personalities specifically to fight the Chromebook onslaught. Technorati pundits who think Google can do no wrong tend to heap praise on Google's desktop efforts. So is any of that translating into sales and usage? Devices running Google’s Linux-based Chrome OS are some of the most affordable laptops and desktops on the market, typically costing under $400. While the profile of Chromebooks/Chromeboxes and their potential for PC market disruption looms large in the industry, even prompting a TV ad response from Microsoft, usage statistics point to the devices making a minimal impact in North America more than two years following their market debut. When you read the full article and full report, what you will find is that no one is using Chrome OS in the US. Google can spend as much money as they like on this losing effort, and still get no measurable return. The bigger lesson is that media hype does not correspond to consumer interest. The media talks about what the media wants to talk about, and supports what it wants to support. They try to create an impression about the success or failure of things that does not necessarily agree with reality. Don't fall for geek media spin. 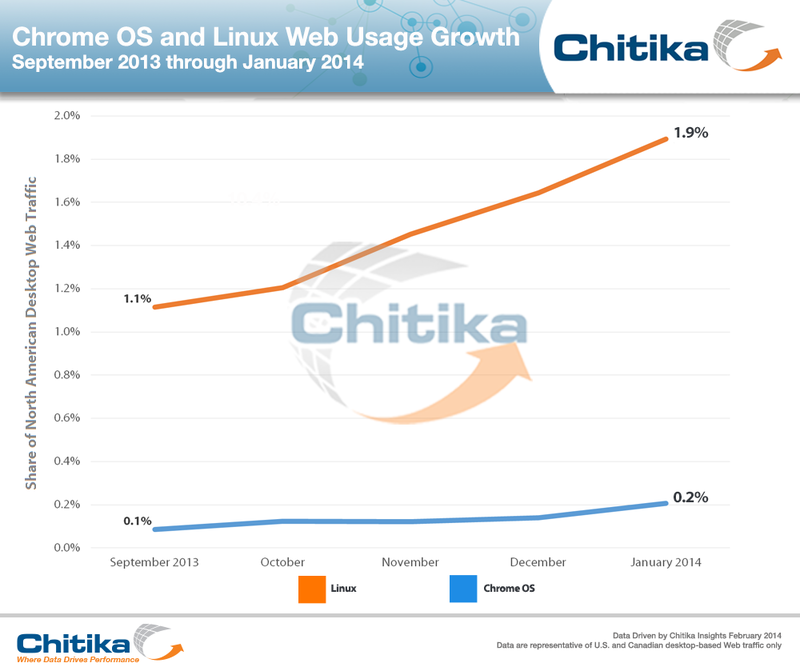 When it comes to actual usage, Chrome OS doesn't exist.